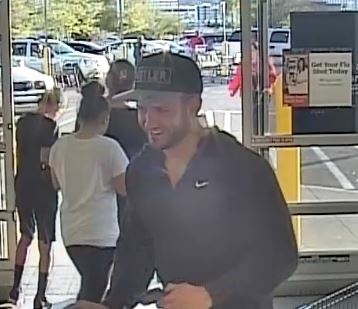 BULLHEAD CITY–The Bullhead City Police Department is asking for the public’s help to identify a man from surveillance photos who allegedly committed fraudulent use of a credit card. A victim from Mesa, Ariz., reported unauthorized charges on her credit card at the Bullhead City Sam’s Club on March 23. Police have since been able to obtain surveillance video of the suspect, said Bullhead City Police spokeswoman Emily Fromelt. Anyone with information about the suspect is asked to call Bullhead City Police at 928-763-9200 or 928-763-1999 after hours. Ask to speak with Detectives, reference case #18-03274.